Go to church every Sunday enless your sick. I skip with my grandparents evry Sunday. We allso do restime evry Sunday. By doing these things we get closer to heavenly father and our family. Elder Sterling W. Sill said, "[Sunday] is the day when we are expected to live at our best, when we put on our best clothes, read our best books, think our best thoughts, and associate with the people who mean the most in our lives. And after we have laid aside the cares that have concerned us during the other six days, we go to the house of prayer and let our minds reach up and try to comprehend the things of God." I know that it is inportent to keep Sunday holy. In the name of Jesus Crist amem. My very favourite part (besides the fact that she wrote this pretty much on her own) is that she spelled Skype as skip, so right after she admonishes everyone to go to church every week (unless you're sick, of course) she admits that she skips with her grandparents every Sunday. How hypocritical! Even she found this funny. "I just don't know how to spell Skype," she shrugged. "So I think this says skip, but I will know it says Skype when I have to say it." Her spelling has a long way to go, though she's been pretty good at studying for her weekly spelling tests. She gets twenty words every week but gets to choose whether to do 1–10, 1–15, or 1–20. So far she's always chosen to do twenty, which is good because the first ten words are usually pretty simple. This week the first ten words were really only five words with two different endings: -ed or -ing. On Monday she started doing her spelling homework the minute she came home from school but soon brought her list over to me and asked me what I thought about words 5 and 6. I stared at her list and, truthfully, my brain broke a little. GAH! It's so terrible it belongs on some sort of OCD/Control Freak Buzzfeed list. "So, what do you think?" she asked. "Is it excited and exciting? Or is it exited and exiting?" "I have no idea which one it is," I said. I sent a message to another mom in the class but—unfortunately and hilariously—she answered saying that she had just popped online to ask me the very same thing because her son wrote them down wrong the exact same way! Rachel did her homework and then I told her she should write a note to her teacher at the bottom to ask for clarification. I considered writing the note myself but then I figured Rachel could write her own note. After all, she was the one who had noticed the problem in the first place. If she really wanted to know which word was supposed to be on her list she could write the note herself. Is it exiting or exciting? My mom wants to know. "My mom wants to know," indeed. So much for not looking like a helicopter parent. 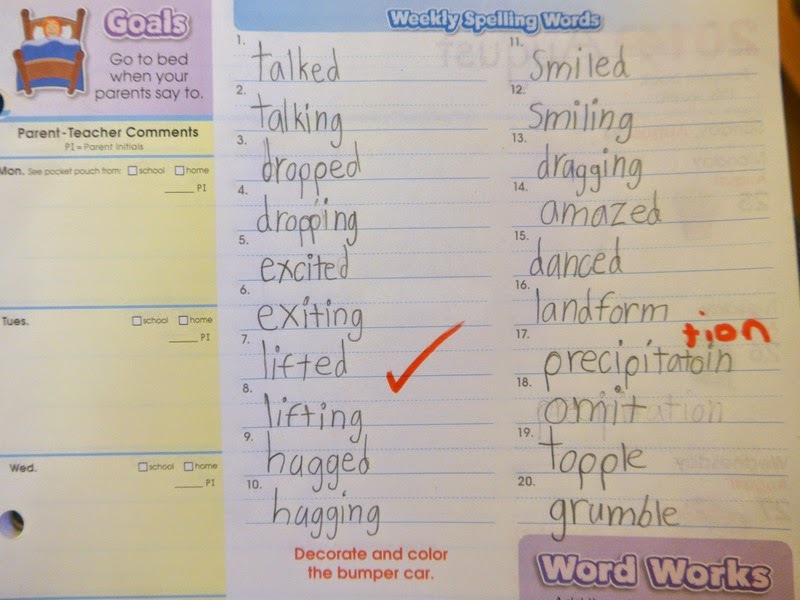 Mrs. M. wrote in Rachel's homework book that afternoon to clarify the list: it was exciting, not exiting. Speaking of those homework books, what do you call them? Agenda? Planner? Reminder? Back in my day - or maybe it was just my school/class/teachers - it seems they were assignment books. In British Columbia they were definitely reminder books. They usually had "Agenda" imprinted on them, but they were universally (in the B.C. universe) called reminder books.